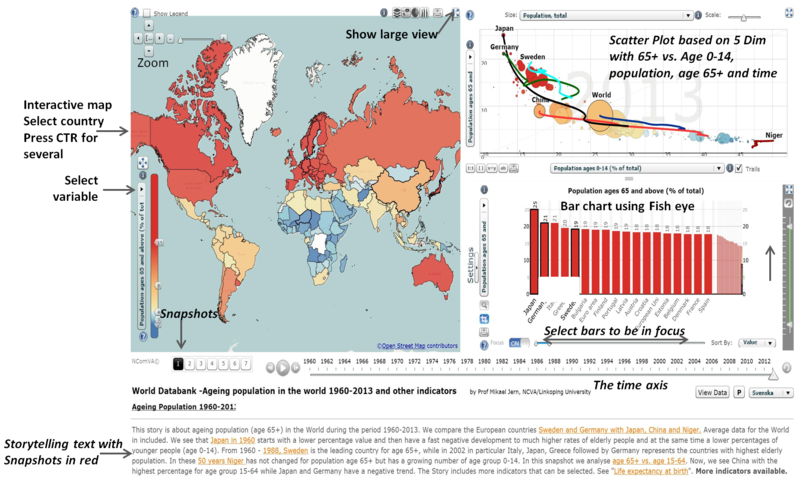 Figure: Statistics eXplorer users can develop interactive educational material based on the 4Ws concept “What-When-Where-Why” encouraging “tell a good-story and tell it well” avoiding boring statistics presentations. Storytelling is one of the most impactful ways to teach, learn, and persuade. As social creatures, we love telling stories and sharing them in a good laugh with others. It doesn’t matter how dry or boring the subject inherently is. If someone can tell a good story, others will listen and enjoy it. Analytics visualization experts are challenged to elicit a strong engagement and wonder in our stories stimulating the readers’ curiosity making them want to learn more and convey a deeper meaning. The same is true with statistical data. Numbers may look deceptively boring if you see them in black and white rows and columns. But if you see statistical numbers represented in colourful, visual views and can interact with the visualizations to find meaning – and, even better, if a good story about the numbers is included, these numbers can become most interesting and engaging. In this context, NCVA introduced in 2008 geovisual analytics software Statistics eXplorer for Adobe/Flash with integrated storytelling applied to BIG spatial-temporal statistical data by means of dynamic visual user interfaces and its increasing role in worldwide collaboration, communication and education. Figure: eXplorer Story Editor – A Story with snapshots and metatext is created in the eXplorer Story Editor – A Story is created, edited and saved and can be shared with colleagues to reach consensus – The Story Editor is integrated into eXplorer (see right panel).The snapshot mechanism helps the author of a story to highlight data views of particular interest, and subsequently guide others to important visual discoveries. Storytelling in our context, is about telling a story on the subject of statistics data and related analytics reasoning about how gained knowledge was achieved and could, hopefully, more engagingly draw the reader into exciting reflections and sometimes change a perspective altogether. The story is placed in the hands of those who need it, e.g. policy and decision makers, teachers and their students but also the informed citizens. Our storytelling is achieved through a special mechanism in Statistical eXplorer that supports the storage of interactive events or "snapshots" through memorized interactive visualization views. A snapshot can be captured at any time during an eXplorer analytics process. Snapshots are an exceptional and important feature of our storytelling authoring analytical reasoning process. Discoveries (snapshots) can be linked into a web document using hyperlinks and applied in combination of the enormous amount of collaboration infrastructure available on the web. Statistics eXplorer facilitates the architecture to support means of capture, add descriptive text, save, packaging and sharing the discovery and results of a geovisual analytics process in a series of snapshots to create a "Story" (see figure below). When the button "Capture" in the Story Editor is pressed, the state of each view in Statistics eXplorer is saved together with user-defined metatext. Before closing eXplorer, the user exports the story into a XML formatted file. Team members can through descriptive text combined with interactive visualization follow the analyst's way of logical reasoning by loading selected stories. At any time a team member can access stories and apply them in Statistics eXplorer. A comprehensive story in the context of a remote collaborative sense-making activity can thus be created by the analyst through a set of linked snapshots. Users will discuss relevant issues through storytelling based on solid evidence, thus raising awareness and increasing the common knowledge on a certain phenomenon. When exploring and making sense of, for example, comprehensive statistics data, we need a coherent cognitive workspace to hang our discoveries on for organizing and navigating our thoughts. 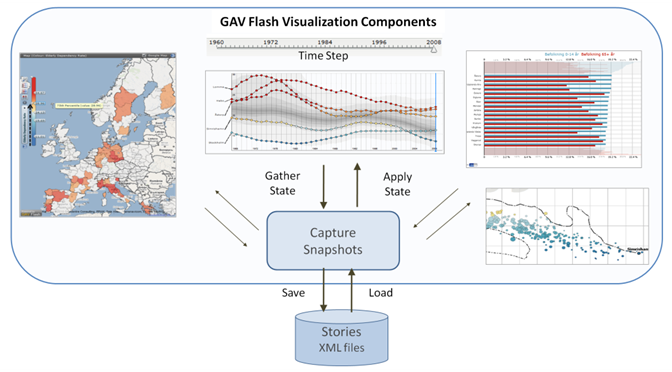 The GAV Flash toolkit includes such means by capturing saving and packaging the results of an exploration “gain insight” process in a series of “snapshots” that could help the analyst to highlight views of particular interest and subsequently guide other analysts to follow important discoveries. The snapshot tool creates a single or a continuous series (story) of visualization captures during the exploration process. In a typical scenario the analyst has selected relevant attributes, time step (temporal data), data items-of-interest, color class values, filter conditions for selected attributes and finally highlights the “discovery” from a certain angle (viewing properties). Before the actual capture is done, the user navigates, for example, the map view to a particular country, select indicators for the scatter plot, select time step. A new view such as PCP can be added to the story etc. A “Capture” is made and all preferred states are saved. When the story later is read, hyperlinks can be initiated and the application will display the state-of-the-snapshots. Hyperlinks that instantiate snapshots and is associative descriptive text represent a central feature in our storytelling mechanism. These could guide the reader in the analyst’s way of thinking. While it’s true that a picture is often worth a thousand words, sometimes a few words and a snapshot provide the difference between a pretty picture and understanding. This focus on publishing through assisted content creation with emphasis on visualization and metadata represents a novel advantage of our storytelling. The author creates a single or discrete series of captures during the explorative process by selecting relevant indicators, regions-of-interest, colour schema, filter conditions focusing on the data-of-interest, or a time step for temporal statistics. Associated explanatory text provides a richer functionality than simple metatext by allowing the reader to click on key words and learn about topics in the story. A story hyperlink is a reference in the story metatext that links to an external URL web site or a captured snapshot. To insert a hyperlink in the metatext the text is selected and a button “Link” is made visible and two options appear: a) new capture (snapshot) or b) link to an external URL. Before the actual capture is done, the user navigates the map view to a particular region, select indicator, select indicators for the scatter plot, and select time step. A “Capture” is made and all preferred states are saved. When the story is read subsequently, hyperlinks can be initiated and Statistics eXplorer will display the state-of-the-snapshots. Hyperlinks that instantiate a state in the eXplorer application are a central feature of the storytelling mechanism, with associated descriptive metatext that can guide the reader (see URL example in figure "World dataBank"in blue text). A few words and a snapshot can provide the difference between a pretty picture and understanding. Figure:The snapshot mechanism scans through all active views and save all active states. The snapshot list contains all the snapshots taken in the current chapter. Each snapshot can be renamed, recaptured and deleted. The exception to this is the "Initial View" that is the initial state the current chapter will start in when you load it. This state can only be recaptured . 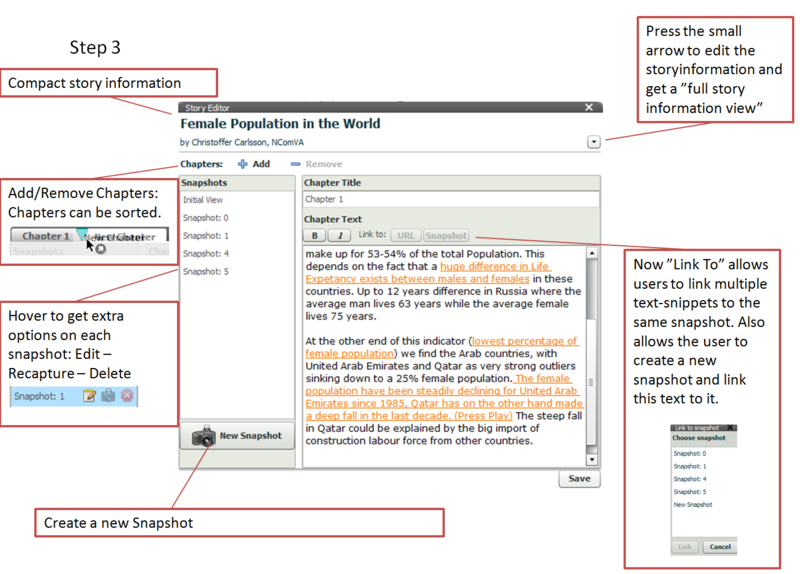 Select a snapshot in the list and the text that are linked to this snapshot are highlighted in the chapter text. This works both ways. Figure: From creating a story with the authoring tool “World eXplorer” to a published Vislet embedded in a Web page with associate metadata and hyperlinks. This three-step approach that seamless integrates tools for “story authoring” and “story telling” provides an education platform for both analysts and teachers to publish highly interactive statistical educational material. The teacher uses World eXplorer to 1) import World statistical data (Excel or direct database to world databank, 2) explore and make discoveries through trends and patterns and derive insight. Gained knowledge is the foundation for 3) creating a story that can be 4) shared with educational colleagues and reach consensus and trust. The visual discoveries are captured into snapshots together with descriptive metadata and hyperlinks in relation to the analytics reasoning. The teacher gets feedback from colleagues, adopts the story and 5) finally publishes “tell-a-story” using a “Vislet” that is stored and documented into special education blogs to be applied in teaching.